Replacement Bio-Sponge (CPF210) for the Penn-Plax Cascade 100 Power Filter. Replacement Filter Cartridge 1-Pack (CPF2C) for the Penn-Plax Cascade 100 Power Filter. Three disposable floss/carbon filter cartridges. Change monthly for maximum filtration. Replacement Filter Cartridge 3-Pack (CPF2C3) for the Penn-Plax Cascade 100 Power Filter.Three disposable floss/carbon filter cartridges. Change monthly for maximum filtration. 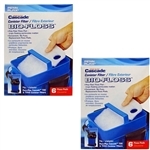 Replacement Bio-Floss 12-pack (2X CCF331) & Bio-Sponge 2-Pack (2X CCF329) for the Penn-Plax Cascade 1200 Canister Filter and Cascade 1500 Canister Filter. Change the Filter Cartridge monthly for maximum filtration. The Bio-Sponge needs to be replaced less often. Replacement Bio-Floss 12-pack (2X CCF331) for the Penn-Plax Cascade 1200 Canister Filter and Cascade 1500 Canister Filter. Change monthly for maximum filtration. 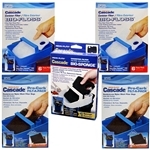 Replacement Bio-Floss 12-pack (2X CCF331), Bio-Sponge 2-Pack (2X CCF329) & Pro-Carb Activated Carbon 4-Pack (2X CCF233) for the Penn-Plax Cascade 1200 Canister Filter and Cascade 1500 Canister Filter. Change the Filter Cartridge monthly & Carbon bi-monthly for maximum filtration. The Bio-Sponge needs to be replaced less often. 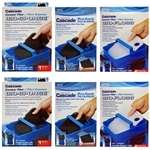 Replacement Bio-Floss 6-pack (CCF331) for the Penn-Plax Cascade 1200 Canister Filter and Cascade 1500 Canister Filter. Replacement Bio-Sponge (CCF329) for the Penn-Plax Cascade 1200 Canister Filter and Cascade 1500 Canister Filter. Replacement Bio-Sponge (CPF310) for the Penn-Plax Cascade 150 Power Filter & Penn-Plax Cascade 200 Power Filter. Replacement Filter Cartridge 1-Pack (CPF34C) for the Penn-Plax Cascade 150 Power Filter and Cascade 200 Power Filter. One disposable floss/carbon filter cartridges. Change monthly for maximum filtration. Replacement Filter Cartridge 2-Pack (2X CPF34C) for the Penn-Plax Cascade 150 Power Filter and Cascade 200 Power Filter. Change monthly for maximum filtration. Replacement Filter Cartridge 3-Pack (CPF34C3) for the Penn-Plax Cascade 150 Power Filter and Cascade 200 Power Filter.Three disposable floss/carbon filter cartridges. Change monthly for maximum filtration. 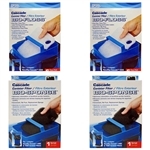 Replacement Filter Cartridge 9-Pack (3X CPF34C3) for the Penn-Plax Cascade 150 Power Filter and Cascade 200 Power Filter. Change monthly for maximum filtration. 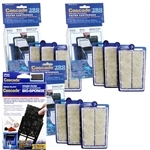 Replacement Filter Cartridge 9-Pack (3X CPF34C3) & Bio-Sponge (CPF310) for the Penn-Plax Cascade 150 Power Filter and Cascade 200 Power Filter. Change the Filter Cartridge monthly for maximum filtration. The Bio-Sponge needs to be replaced less often. Replacement Sponges for the Penn-Plax Cascade 170 INTERNAL Filter. Two-pack. Penn-Plax part# CIF4FI. Replacement Filter Cartridge 3-Pack (CPF6C3) for the Penn-Plax Cascade 20 Power Filter.Three disposable floss/carbon filter cartridges. Change monthly for maximum filtration. 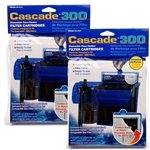 Replacement Penn-Plax Cascade 300 Internal Filter Carbon Cartridges, 2-Pack (CIF10). Replace every two to three weeks. 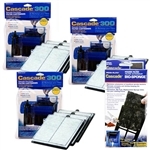 Replacement Penn-Plax Cascade 300 INTERNAL Filter Sponge. Penn-Plax part # CIF1FI. Replacement Bio-Sponge 2-Pack (CPF510) for the Penn-Plax Cascade 300 Power Filter. Replacement Filter Cartridge 1-Pack (CPF5C) for the Penn-Plax Cascade 300 Power Filter. Change monthly for maximum filtration. Replacement Filter Cartridge 2-Pack (2X CPF5C) for the Penn-Plax Cascade 300 Power Filter. Change monthly for maximum filtration. 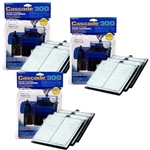 Replacement Filter Cartridge 3-Pack (CPF5C3) for the Penn-Plax Cascade 300 Power Filter.Three disposable floss/carbon filter cartridges. Change monthly for maximum filtration. Replacement Filter Cartridge 9-Pack (3X CPF5C3) and Bio-Sponge 2-Pack (CPF510) for the Penn-Plax Cascade 300 Power Filter. Change the Filter Cartridge monthly for maximum filtration. The Bio-Sponge needs to be replaced less often. 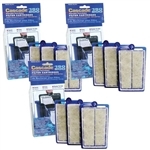 Replacement Filter Cartridge 9-Pack (3X CPF5C3) for the Penn-Plax Cascade 300 Power Filter. Change monthly for maximum filtration. Replacement Penn-Plax Cascade 400 Internal Filter Carbon Cartridges, 2-Pack (CIF11). Replace every two to three weeks. Replacement Penn-Plax Cascade 400 INTERNAL Filter Sponge. Penn-Plax part# CIF2FI. Replacement Bio-Floss 6-pack (CCF131) for the Penn-Plax Cascade 500 Canister Filter. Replacement Bio-Sponge (CCF129) for the Penn-Plax Cascade 500 Canister Filter. 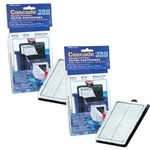 Replacement Penn-Plax Cascade 600 Internal Filter Carbon Cartridges, 2-Pack (CIF12). Replace every two to three weeks. Replacement Penn-Plax Cascade 600 INTERNAL Filter Sponge. Penn-Plax part# CIF3FI. 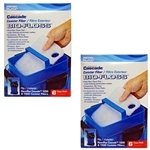 Replacement Bio-Floss 12-pack (2X CCF231) & Bio-Sponge (2X CCF229) for the Penn-Plax Cascade 700 Canister Filter and Cascade 1000 Canister Filter. Change the Filter Cartridge monthly for maximum filtration. The Bio-Sponge needs to be replaced less often. Replacement Bio-Floss 12-pack (2X CCF231) for the Penn-Plax Cascade 700 Canister Filter and Cascade 1000 Canister Filter. Change monthly for maximum filtration. Replacement Bio-Floss 12-pack (2X CCF231), Bio-Sponge (2X CCF229) and Pro-Carb Activated Carbon 4-Pack (2X CCF233) for the Penn-Plax Cascade 700 Canister Filter & Cascade 1000 Canister Filter. Change the Filter Cartridge monthly & Carbon bi-monthly for maximum filtration. The Bio-Sponge needs to be replaced less often. Replacement Bio-Floss 6-pack (CCF231) for the Penn-Plax Cascade 700 Canister Filter and Cascade 1000 Canister Filter. Replacement Bio-Sponge (CCF229) for the Penn-Plax Cascade 700 Canister Filter & Penn-Plax Cascade 1000 Canister Filter. Replacement Filter Cartridge 3-Pack (CPF1C3) for the Penn-Plax Cascade 80 Power Filter.Three disposable floss/carbon filter cartridges. Change monthly for maximum filtration.